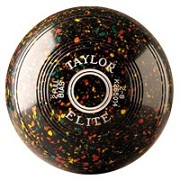 Bowls World supply 3 types of Taylor Crown Green bowls: the Deluxe, the Gripper and the Elite. In addition, we supply the Taylor Standard Crown Jack and the Taylor Crown Elite Practise Jack. We are also pleased to supply the new Midnight Burst, a special edition bowl. Taylor Crown Green bowls are available from Bowls World with free 48 hour postage to destinations in England, Wales and the Scottish Lowlands. Crown Green bowls is a form of bowls which is played mostly in the North of England but also in some places in Wales, West Midlands and Shropshire. It differs from flat green bowls in that the green has a ‘crown’ which rises up to 18 inches in the centre. There are no rinks, and players can play all over the green. The jack used is also biased unlike a flat green jack. The bowls used for Crown Green bowls are made from same material as that of flat green bowls, but they are slightly smaller and lighter. They have a generally stronger bias than flat green bowls, and can only be used for crown green bowls. They are sold in pairs, rather than sets of four. Sizing is by weight and ranges from 2/2 to 2/12. And bowls are available in a range of densities, which also affects the weight of the bowl. Crown Green bowls can come with or without “mounts”. Mounts are inserts in the side of the bowl and are usually in a different colour to the bowl. Mounts are a way of customising the appearance of the bowl. Bowls World currently sell only Taylor Crown Green bowls. We plan to add Crown Green bowls by Drakes Pride and Henselite to our range in the future. Taylor make Crown Green bowls to the same exacting standards as their flat green bowls and they therefore have the same reputation for accuracy and consistency. Here is a quick overview of the main features of the Deluxe, Grippa and Elite. The Deluxe is the classic Crown Green bowl which performs as well as it looks. It features equal 1 inch mounts and is supplied with Taylor’s special ornamentation as standard. Available in sizes 2/4 to 2/12, and in densities Low, Standard and High. Black or Brown. Taylor’s have worked closely with crown green expert Roy Armson to produce the Grippa. It has the same bias and performance of the Deluxe, but features a revolutionary Hi-Profile crescent-shaped grip, making it easier to play in wet conditions, and is now unmounted. Available in sizes 2/4 to 2/12, and in densities Low and High. Black or Brown. The Elite provides all the playing performance of the Deluxe or Grippa, but at a lower price. It has coloured rings instead of mounts and minimum decoration, with plain grip. Although a plainer bowl, it is made, and plays, to Taylor’s usual exacting standards. Available in sizes 2/0 to 2/12, and in densities Standard and High. Black only. Crown Green bowls are traditionally black or brown, and tend not to be available in the brighter colours now being seen in the flat green bowls. But, keen to offer some colour to their Crown Green customers, but without veering too far from tradition, Taylor have introduced the Midnight Burst speckle – a multicolour speckle on a black background which still gives a dark appearance overall. It is available on Grippa and Elite models, sizes 2/4 to 2/12, standard density only.